Teresa of Avila: Spiritual Battles and Interior Peace « Enlarging the Heart. St. Teresa’s lizards are our spiritual battles that lead to inner peace. They are the sufferings we all must go through if we wish to attain the heights of (to be Methodist) Christian perfection. We want the easy path, but it is not the path to wholeness, fullness, union with God, or perfection. Instead, we must encounter the lizards. Read the above post, it is good! This week’s saint is Charles Wesley (1707-1788), given that the day for his and John’s commemoration was two days ago (John Wesley was saint of the week here and here). Charles is the less famous of the two famous Wesley brothers, and I think this is a bit of a shame. Charles Wesley was as much a man of action as his elder brother. He, too, was a founding member of the “Holy Club” at Oxford, meeting with friends to read the Greek New Testament and to transform their lives. He, too, lived a disciplined life — a discipline with method, thus Methodist and Methodism. * He, too, was an ordained priest of the Church of England. He, too, was involved in the evangelical revival and preaching the Gospel amongst the poor of England. He, too, went to preach the Gospel in Georgia. He, too, sought Christian Perfection. Charles, however, was not merely a man of action like unto his brother. He was also a man of action in opposition to his brother. An example of such opposition was when he burst in on John’s first wedding and dragged his brother out, explaining to the elder Wesley that he wasn’t exactly suited to marriage. My understanding is that John’s second attempt at getting married succeeded but without happy product — proving Charles right. Unlike John, Charles was happily married, to Sarah Gwynne. Sarah Gwynne, like their mother Susannah Wesley, probably counts as one of the many intrepid women of the Faith, for she accompanied her husband on his evangelistic journeys. Charles eventually ended his itinerant lifestyle, which probably helped keep his marriage a happy one. He looked after the Methodists of Bristol from 1756-1771, then relocated to London, where his ministry included Newgate prison. Charles also differs from John in virulent opposition to any schismatic activity on the part of the Methodists. He wished to keep Methodism a movement within the Church of England, and thus he wrote a hymn against the event of John ordaining Coke rather than celebrating it. Despite confusing moments such as when he writes in “And Can It Be?” that Christ “emptied Himself of all but love,” these hymns demonstrate Wesley as one of the great devotional minds of the English language. Indeed, the nearness of the Divine in these hymns their clarity of the Gospel and its impact on the Christian life make them among the works of wondrous, clear theology. They are praise of God worth singing, the sort we encounter far less often in the newer songs of today. Charles Wesley was also a clever man in his hymnography, for his words could be set to the tunes of drinking songs. This made them very memorable for the poor, drunken souls for whom the hearts of the Wesleys burned. 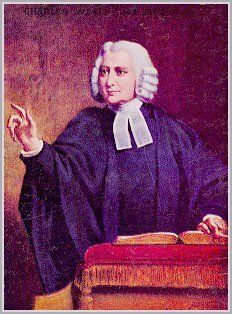 And so Gospel truths could be sung and remembered as cast in the simple poetry of Charles Wesley. This is a very great gift to the English people, and one not to be underestimated. Today is the feast day of John and Charles Wesley in the Anglican calendar. 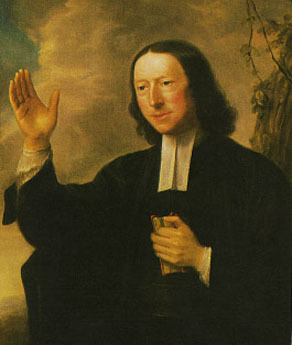 John Wesley (1703-1791) is the more famous of the two famous Wesley children. He is quite famous these days for being an “Arminian”, and thus figures in the endless theological debates you will find out in the internet. Nevertheless, just as Calvin was more than predestination, so Wesley was more than freewill. So if you are a Calvinist, read on. Begin and end every day with God; and sleep not immoderately. Be diligent in your calling. Employ all spare hours in religion as able. All hollidays [should be devoted to religion]. Avoid curiosity, and all useless employments and knowledge. Never on any account pass a day without setting aside at least an hour for devotion. Avoid all manner of passion. At Oxford, the Wesleys also encountered the Church Fathers, classical literature, Thomas a Kempis’ Imitation of Christ, Jeremy Taylor’s Holy Living and Holy Dying, and the recent bestseller A Serious Call to a Devout and Holy Life by William Law (see my post here). In the Fathers, Kempis, Taylor, and Law, the Wesleys will have found a high call, a call to live holy lives centred upon Christ and his love for us, lives of faith that produces good works. In his sermon on fasting, we see that John Wesley strove to steer a course between the extremes of those who believe that good works are nothing and those who believe they are everything. He believed that they were the result of faith but that faith is what saves us. Wesley now knew that none of his holy living, no amount of partaking of communion, none of his prayers, none of his theology, no success as a missionary would or could save him. All that could save John Wesley was Jesus Christ and his gift of grace freely given. ** He was truly converted to Christ. And so, from 1739 to the end of his long life in 1791, John Wesley was committed to evangelism, to bringing this Good News of Jesus Christ to the people of England, and to waking up the Church of England. More on John Wesley to come . . .
*I have also heard people say that Wesley was called a “Methodist” because of his method of organising the movement he started. Somehow that is less convincing. **To people who want to argue against Arminianism with some Augustinian arguments about grace being inescapable and therefore freewill illusory — not here. Not now. Embrace Wesley as a brother, see how much like you he is. The Internet Monk recently wrote an excellent post entitled, “Your Mission: ‘Resacramentalize Evangelicalism.’” Being raised Anglican, I’m not the primary audience of his post. In it, he makes good points about what a sacrament is and how Evangelicals need to rediscover not simply “the sacraments” but the concept of God inhabiting the things that go on during public worship. This reminded me of an essay I read in Ancient & Postmodern Christianity: Paleo-Orthodoxy in the 21st Century* (I posted on a different essay from the book here.) The essay I thought of was, “Reclaiming Eucharistic Piety: A Postmodern Possibility for American Evangelicals?” by Joel Scandrett (pp. 155-169). The Free Methodists, of course, are not alone in this practice of infrequent Communion. Many of the denominations that call themselves “evangelical” and are descended from the same roots as the Free Methodists also partake of the Lord’s Supper rarely. I had friends in High School who would receive Communion maybe twice a year. If Wesley is right, they were missing out on the very medicine of immortality! So come! Rediscover the sacramental heritage of Wesley’s evangelicalism! Encourage more frequent Communion at your local church. Read Wesley’s reasons why. Read some of the Reformation discussions of Communion. Read the tales of those who have felt that their spiritual lives have profited from the practice of frequent partaking of Holy Communion. If Christ is truly present in the sacrament, then take it to your comfort. *Ed. Kenneth Tanner & Christopher A. Hall. Downers Grove, Illinois: IVP, 2002. **Quoting Randy Maddox, Responsible Grace (Nashville: Abingdon, 1994), p. 202.